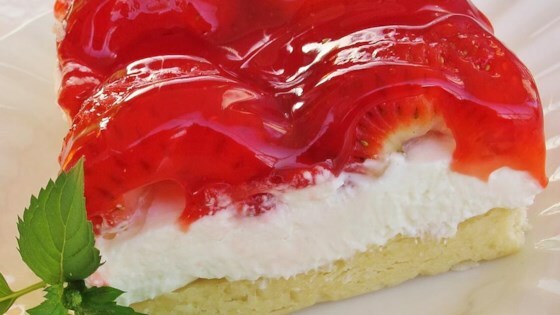 "Light and sweet cream cheese layer topped with strawberries on a pecan crust. High in taste!" Mix the butter, flour, and pecans in a bowl, and press into a 9x13 inch baking dish. Bake 10 to 15 minutes; do not allow to brown. Set aside until completely cool. In a bowl, mix the cream cheese and confectioners' sugar until smooth. Blend in the whipped topping. Spread over the cooled crust. Refrigerate 8 hours, or overnight. Top with strawberries and drizzle with glaze to serve. This is a great recipe. I've always made it with a graham cracker crust (no baking!) And I layer the cream cheese layer, strawberries and top with more whipped cream. DELICIOUS! We really liked this recipe except for the crust. It had way to much butter and when it was cooled it was imposible to get out of the pan. A very good recipe, very tasty. I think the secret to the crust is not allowing it to brown, I only baked it for 9 minutes and it came out perfect. Very delicious recipe. I made the crust the night before to help speed up the dessert the next day. Many asked for recipe. Enjoy. I made this for a fundraiser and it sold out in minutes. Made a second one and the same thing went right away. Thank you for sharing this recipe.